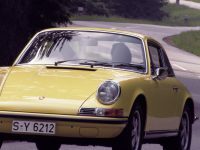 From 1974, Porsche used the Carrera name on its range- topping 911. The 911 Carrera used essentially the same 2.7-litre, 210bhp engine as the previous year’s RS for all markets except the USA. In 1975 it was available with an optional new whaletail spoiler.